Timberwolves season ticket holders received renewal notices for the 2018-19 season. Among the increases, $10 tickets were set to jump to $17 per game. Enticed by the prospect of an exciting season and lured by rock-bottom prices, Melissa Berman took the plunge and bought Timberwolves season tickets this year. Her family has had them for a number of seasons, but Berman — a law student at Mitchell Hamline — decided that for $10 per game for 41 regular-season home games she could afford her own. The Wolves have delivered on their potential, sitting at 35-25 as the Western Conference’s No. 4 seed. Minnesota had won 13 consecutive home games before a loss to the Rockets on Wednesday. “It feels greedy and like a slap in the face,” Berman said in explaining why she canceled her tickets. 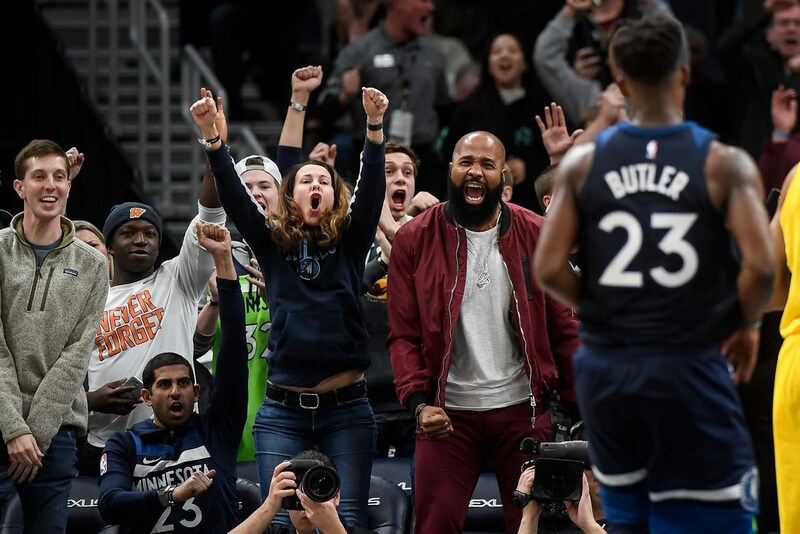 She’s a great example of the type of fan the Wolves are eager to gain and retain, but she’s also now a perfect illustration of the Timberwolves’ challenge. As the team bottomed out through 13 playoff-less seasons, so did ticket prices. Ryan Tanke, the Wolves’ Chief Revenue Officer, said in a sit-down interview this week that season ticket prices for the team this season are in the bottom five of the NBA. Now that the franchise appears to be on the upswing again, winning inside a renovated Target Center and selling out some nights, prices are going up. But even with across the board increases at different season ticket levels, with some fans experiencing jumps of 40 percent or more, the Wolves will be in the bottom 10 of season ticket prices next year, Tanke said. Tanke said he anticipates overall season ticket renewal rates will be “north of 80 percent” this season from a base of 8,500 full season ticket equivalents (which counts full and partial packages). Losing about 20 percent of that base would mean a loss of roughly 1,700 FSEs, but Tanke said early projections suggest the Wolves will have an net gain of 1,000 next season – meaning the losses will be offset by 2,500 to 3,000 new season ticket customers. The Wolves are a mid-market team, Tanke is quick to point out, and ticket prices are slated to climb more toward the middle of the pack in coming years through a “series of increases” as long as they keep winning. The delicate dance is doing so without alienating their longest-standing and longest-suffering clients in the process. Ackerman said his lower-level season tickets are slated to increase by 42 percent next season. As a result, he’s moving to a lower-priced seat and getting a single ticket instead of two. It’s a market correction that is taking the Wolves closer to the ticket prices they offered when the franchise was routinely making the playoffs in the early 2000s. Two thirds of season tickets are increasing by less than $10 per game, and nearly half are increasing by less than $5 per game, Tanke said. That adds up, though, and going from $10 to $17 as was the case with Berman’s tickets — while still in that first range of going up less than $10 — produces a gaudy 70 percent increase. Owner Glen Taylor — who also owns the Star Tribune — has lost money during previous losing seasons, and team payroll figures to swell with Andrew Wiggins’ max contract set to kick in next year with two more for Karl-Anthony Towns and Jimmy Butler potentially on the horizon. “We want to invest in their experience and invest in their team,” Tanke said. Berman, for her part, says she’s still invested in the success of the Wolves. She plans to go to games when the Wolves offer student discounts, look for deals on the secondary market and use her family’s tickets when offered. But her days of being a season ticket holder are over, at least for now.